Merrill Lynch has revealed that some of its richest clients are so alarmed by the state of the financial system and signs of political instability around the world that they are now insisting on the purchase of gold bars, shunning derivatives or “paper” proxies. Gary Dugan, the chief investment officer for the US bank, said there has been a remarkable change in sentiment. “People are genuinely worried about what the world is going to look like in 2009. It is amazing how many clients want physical gold, not ETFs,” he said, referring to exchange trade funds listed in London, New York, and other bourses. “They are so worried they want a portable asset in their house. I never thought I would be getting calls from clients saying they want a box of krugerrands,” he said. Merrill predicted that gold would soon blast through its all time-high of $1,030 an ounce, and would hit $1,150 by June. 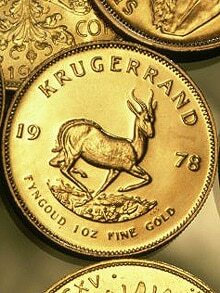 Rich investors are spurning gold exchange traded funds in favour of krugerrands. Merrill expects global inflation to hover near zero, with rates of minus 1pc in the industrial economies. This means that yields on AAA sovereign bonds now at 3pc will offer a real return of 4pc a year, which is stellar in this grim climate.